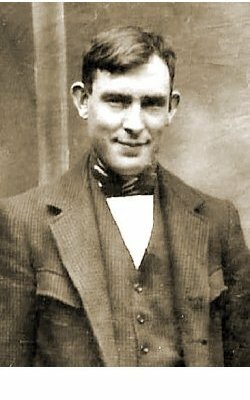 Benjamin Thorne, known as Ben, was born in Yeovil on 18 August 1895 but very little is known about his early life. His parents were travellers; his father William came from Somerset, his mother Ellen was Irish and they married in Bristol in 1919, settling in Yeovil around 1925-26. However Ben Thorne became a familiar sight around Yeovil with his knife and scissor grinding machine. For years he would push his little hand-cart around the town and sharpen blades of all descriptions for both companies and individuals. In the 1990s his daughter, Mrs Penelore Baker recalled "My father lived in Yeovil for seventy years and he used to sharpen all the blades for the gloving scissors at the gloving factories. He also used to sharpen the blade on a lawnmower for just two shillings." His other daughter, Mrs Lillian Mash, recalled "Apart from knife grinding he fixed pots, pans, china, glass and even mended umbrellas. He served in the Somerset Light Infantry in World War One and later ran the lodging house with my mother and myself at 111 Park Street (the former Cross Keys beerhouse). He bred budgerigars and ran a smallholding at the bottom of the garden and he even built a boxing ring in the basement where he held boxing events. He served in the 3rd Somerset Yeovil Home Guard, Q Company, 5 Platoon. He rebuilt the side of our house when a bomb landed in Ninesprings in 1942." Ben was listed twice in Kelly's Directory of 1935, once as a 'Lodging House Keeper (Registered)' and also as a 'Knife & Scissor Grinder' - both of 111 Park Street. 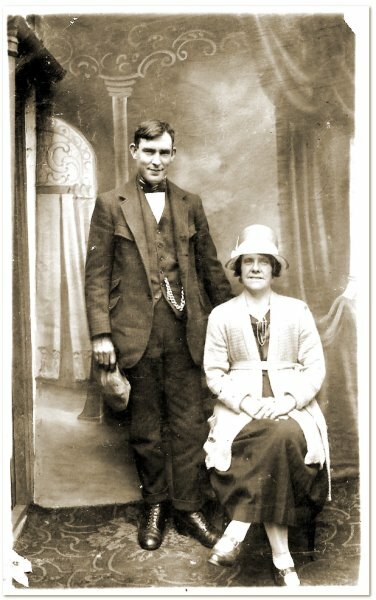 Benjamin and Florence Thorne, photographed around 1919 - their wedding photograph? 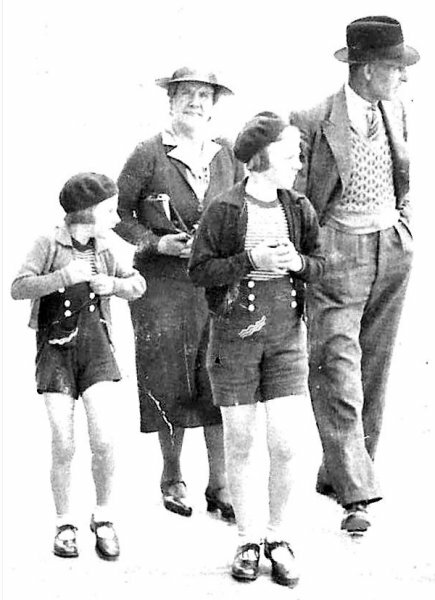 Benjamin and Florence Thorne, photographed in 1939 walking along the front at Weymouth with their daughters Lillian and Florence. NCOs and other ranks of 3rd Somerset (Yeovil) Battalion Home Guard, Yeovil Borough Company circa 1944. Seventh from the left in the back row is Ben Thorne (thanks to Rob Baker) but can you name anyone else? 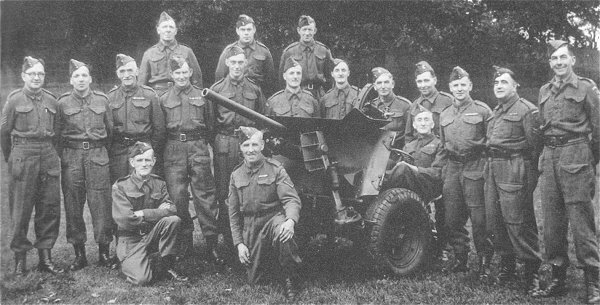 3rd Somerset (Yeovil) Battalion Home Guard, Yeovil Borough Company, Q Section, No 5 Platoon, posing with their 2-pounder anti-tank gun in December 1944. 4th from left, middle row, with barrel of the 2-pounder aimed at his nose is Ben Thorne (thanks to Rob Baker) but can you name anyone else? 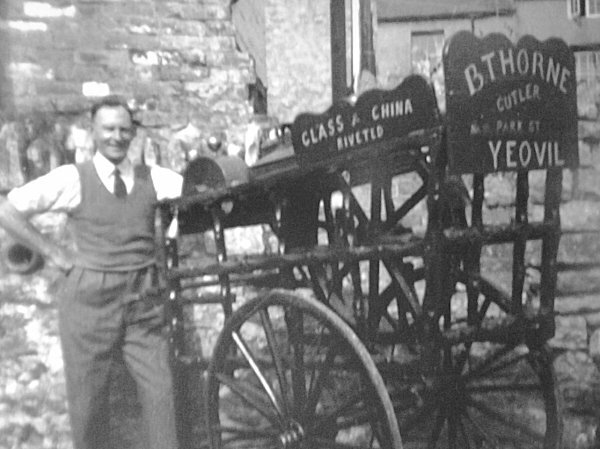 Ben Thorne with his knife-grinding hand cart - a once familiar sight on Yeovil's streets. This photograph shows Ben Thorne's wife, Florence (at left) who ran the Cross Keys lodging house in Park Street with her husband and his parents. 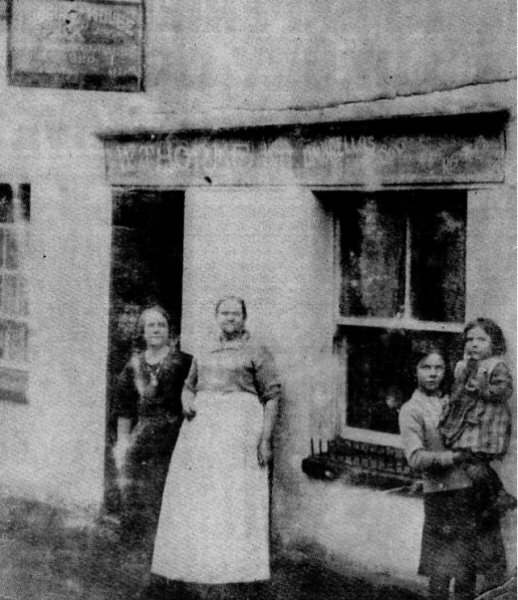 She is pictured outside the Cross Keys (by this time a lodging house) with Ben's mother, Ellen, and daughters Caroline and Theresa.